Would you believe the density of snails on this plant (a crucifer) that is almost completely defoliated! I took this picture at night, when it was very damp and warm. 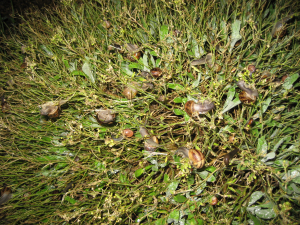 The plant grows in a walled bed (more of a walled trough really) that is a refuge for snails.